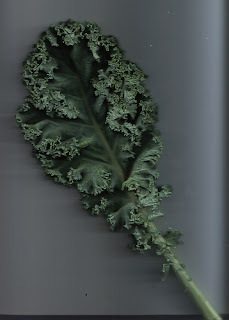 Behind the French Menu: Kale (Borecole) and its Family Members in French Cuisine. Bok Choy, Cauliflower, Chinese Cabbage, Kale or Borecole, Kolrabi and Romanesco Broccoli on French Menus. 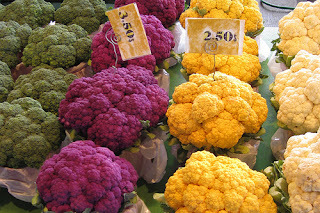 Four colors of cauliflower, choose yours. The French name chou-fleur translates as cabbage flower, and cabbage is a descendant of kale. The English name ‘koli-flower” indicates the kale flower. This post includes a few of the most popular kale family members seen on French menus, and the cauliflower is one of the earliest family members; certainly the Greeks cultivated it in the 6th-century b.c.e. Cuisses de Grenouilles et Purée de Chou-fleur aux Amandes et Jus de Persil –Frog’s legs served with a cauliflower puree, flavored with almonds and parsley juice. (see the appendix Herbs and Spices, Mushrooms and Truffles: Persil). Royale de Chou-fleur aux Crevettes, Tartine d'Encornets en Chermoula – Cauliflower with shrimps served with as an open sandwich with small calamari prepared with chermoula. Chermoula is a North African marinade; it is mainly seen on menus with seafood and fish; but occasionally vegetable and meat dishes are made with chermoula. The primary flavors are garlic and coriander and will also include olive oil, cumin. 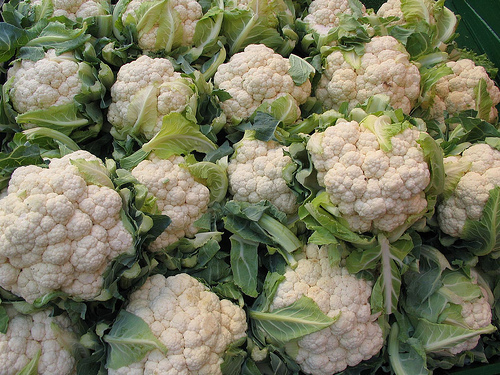 The name Royale de Chou-fleur for the regular Chou-fleur, cauliflower, will be on quite a number of menus. Royal was added to its name by Alexander Dumas (Père). Alexander Dumas (Père) was the author of the Three Musketeers and the Count of Monte Christo and hundreds of other books; he was also a recognized gourmand and an excellent cook who truly appreciated and loved cauliflower. The Royal status Alexander Dumas (Père) gave to cauliflower is a tradition that many French chefs continue today. Alexander Dumas Père apart from all his novels and plays authored two books on food for gourmands including The Grand Dictionary of Cuisine; it was published posthumously.The book is available in an excellent edited English translation entitled Dumas on Food: (Selections from Le Grand Dictionnaire de Cuisine by Alexandre Dumas (Père). Translated and edited by Alan Davison (Author). French and Italian market gardeners have done all sorts of amazing things with cauliflowers. They began by growing miniature cauliflowers called mini chou-fleur that look beautiful and taste the same as their larger forbears. The Italians have gone on to colored variations, the chou-fleur pourpre and others. Choux Chinois - Chinese cabbage. Chinese cabbage is the one Chinese cabbage that usually gets its French- English translation on French-Asian restaurant menus correct. 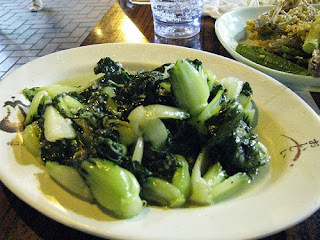 French-Asian restaurants use many other Asian cabbages, and there the many Chinese cabbage names become confused. 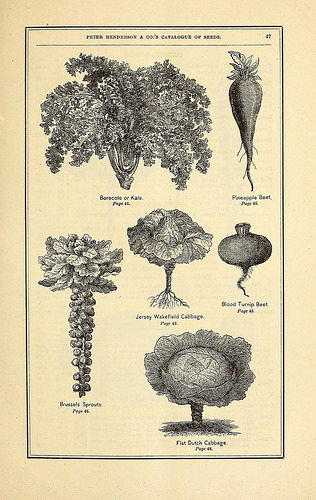 Trade brought kale to China and the Chinese developed many hybrids. Boeuf Émincé Sauté aux Choux Chinois – Slices of beef sautéed with Chinese cabbage. Chou Chinois Farci au Porc, Crabe et Champignons – Chinese cabbage stuffed with pork, crab and mushrooms. Chou Frisé, Chou d'Aigrette – Kale or Borecole; this is the most popular edible kale. It is the relatively strong tasting and is one of the founders of the cabbage family. It will be on more menus in Italy than in France but is also popular in French areas close to the Italian border. Chou Frisé will be served as a garnish or prepared and stuffed in a manner similar to stuffed cabbage. Filet de Morue en Croûte de Parmesan, Servi Avec Purée de Pommes de Terre, Chou Frisé et Mini-Carottes Braisés- A filet of redydrated and desalted cod prepared in a covering of Parmesan cheese, served with pureed potatoes, kale and braised baby carrots. Faisan Rôti au Four, Embeurré de Chou Frisé au Lard – Oven roasted pheasant accompanied by buttered kale and bacon. Kale is at the top of this photograph, on the left, from Peter Henderson and Co's seed catalog. NY: 1872. 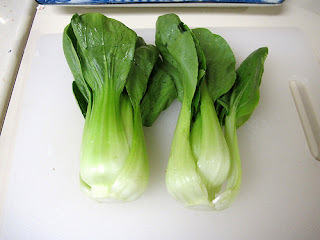 Chou Pak Choi, Bok Choy or Pak Choi - Bok Choy, Pak Choi or Spoon Cabbage; Bei Cai in Mandarin. From my own rankings that I took arbitrarily in French-Asian restaurants this seems to be the most popular variety of Chinese cabbage; it has long green leaves and white stalks which end with a round spoon looking attachment to the root. It is considered the sweetest of the Chinese cabbages. Raviolis de Porc et Bok Choy Vapeur ou Grillé – Pork ravioli and Bok Choy steamed or grilled. Chou Rave or Kohlrabi – Kohlrabi. Also called the German turnip or turnip cabbage. Kohlrabi is a variety of cabbage, and there are white, purple and light green varieties, inside the root it is white. 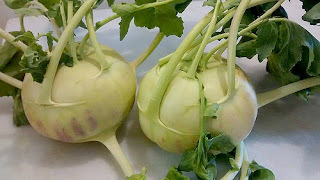 Kohlrabi is usually served cooked; it can be part of a vegetable soup, steamed, boiled or roasted. 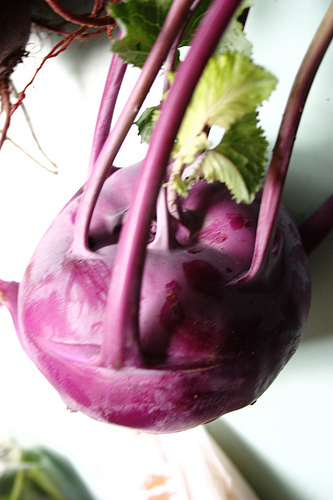 Kohlrabi may be served cold and the kohlrabi root is often served raw in a salad. Le Filet Mignon de Veau de Notre Pays en Chou Rave et Sauce Périgourdine – Local supplied beef has veal fillet, in the USA the tenderloin, for this dish; it is served with kohlrabi and Sauce Perigdordine. (see the appendix Sauces: Sauce Perigourdine).In France the term Filet Mignon is only rarely used, as in the menu listing, for beef or veal, however, it is used for pork. Poitrine de Faisane Doree Accompagnee de sa Raviole de Chou Rave aux Figues - Gilded Breast of pheasant accompanied by ravioli of kohlrabi and figs. 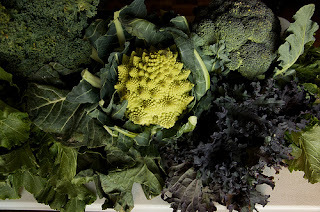 Photograph courtesy of melissa b.
Chou Romanesco – Romanesco Broccoli or Romanesco cabbage. 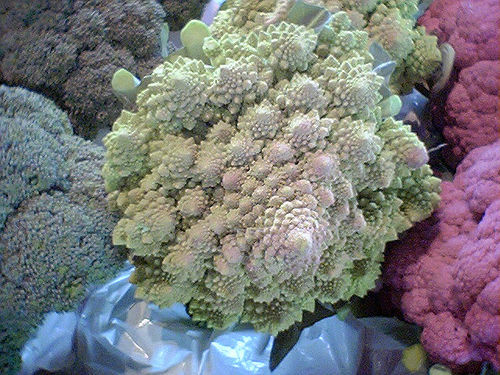 No one seems to be sure if this exquisite vegetable is closer to broccoli or cauliflower. In any case, they are related, and I think the taste and texture are closer to broccoli. This new mixture of broccoli and or cabbage was an Italian creation; from my experience, it is now seen on as many French menus as Italian. Sommités de Chou Romanesco à l'Huile d'Argan – The pointed florets of Romanesco broccoli served with Argan oil. The word sommités means summits or peaks in French and is used, in this menu, to glamorize the attractively pointed florets. (See Oils: Argan). Cabillaud and Morue. Cod, the Fish; Cabillaud or Morue de l'Atlantique on French Menus . Morue and Stockfish Rehydrated Cod. Cod is the Most Important Fish in the World and the Most Popular Fish in France. Cuisses de Grenouilles. Enjoying Frogs' Legs in France. Cuisses de Grenouilles on French Menus. Huile d'Argan – Argan oil on French Menus.